Can I purchase directly from Morse? Who can I call to recommend drum equipment? What if I have a custom application? Where can I find a parts diagram for my Morse drum equipment? What spare parts are recommended for preventative maintenance? What drum handling safety procedures should I be aware of? What is the "half-full" capacity rating? Are there forklift attachments to handle a cardboard drum? Is it possible to disconnect the air hose in order to move drum handler? . . .or must the hose be connected while moving? What standards does Morse below-hook drum handlers comply with? Where can I get a Certificate of Compliance? How can I find my local Morse dealer for drum equipment? Where can I purchase parts for my Morse drum equipment? What will price and delivery be? 1. Can I purchase directly from Morse? All Morse products are sold through our worldwide dealer network. To find your local Morse dealer, please submit this simple form. 2. Who can I call to recommend drum equipment? We have a network of dealers throughout the world to assist you with your drum equipment needs. We can help you find a Morse dealer near you. 3. What if I have a custom application? Our engineers have designed drum equipment for many custom applications, and will consider requests for new ideas. Please feel welcome to request a quote. Our engineering and new product development departments are equipped with the technology to develop, analyze and test custom drum handling equipment. 4. Where can I find a parts diagram for my Morse drum equipment? In most cases, to find the correct parts diagram you will need the model number and serial number from the name plate on your Morse drum equipment. Find your model at: Parts diagrams and Operator's Manuals. . . or look for the	button on each drum equipment page. 5. What spare parts are recommended for preventative maintenance? Recommended Spare Parts Kits are available for most current models. Recommended spare parts are also noted with an asterisk on many Parts Lists in the Operator's Manuals. You may also call us or your local Morse dealer for recommended spare parts for your Morse drum equipment - (315) 437-8475. 6. What drum handling safety procedures should I be aware of? Heavy drums should always be moved with proper drum equipment specifically designed for that purpose. Mishandling a heavy drum can cause serious injury, damage the drum, waste valuable contents or contaminate the environment. All employees who handle drums should be trained in proper procedures and use of drum equipment. Tips for Drum Handling Safety. . .
7. What is the "half-full" capacity rating? The capacity of drum equipment for tilting a drum is reduced for a partially full drum due to the unbalanced and shifting load. A half-full drum is harder to tilt, and places more stress on the gearing and other components. The half-full rating of a drum handler indicates the capacity for tilting an unbalanced, bottom-heavy drum. Example: Capacity of Hydra-Lift Drum Karriers is 800 Lb. (363 kg) for a full drum, but reduced to 500 Lb. (227 kg) for a half-full drum. 8. Are there forklift attachments to handle a cardboard drum? Yes, there are forklift attachments to handle your cardboard drums, also called fiber drums. They are made of paper in layers and may have metal rims. However, some have no metal parts. Move your upright drums with your forklift with MORSpeed TM forklift attachments. They will work with fiber drums that have metal rims and their lids fastened. They have jaws to grab the metal rim. To lift and pour a drum with your forklift, the Forklift-Karriers are available. With the correct accessories installed, they handle a fiber drum. Diameter Adaptors for smaller drums are sized for common diameters made in US. There may be drums in Europe that have different diameters. 9. Is it possible to disconnect the air hose in order to move drum handler? . . .or must the hose be connected while moving? Short answer: For drum handlers with hydraulic drum lift, you may disconnect the air hose for moving. You only need the air hose connected to lift or turn the drum. More detail: Units with hydraulic drum lift, using oil, not air in the lifting cylinder. The air motor turns the hydraulic pump to push oil into the cylinder for lifting. There is a hydraulic check-valve that holds the oil in the cylinder to hold up the drum. There is a hand-operated release valve for lowering of the drum. The drum will stay up without the air supply. The hose need not be attached. The operator can lower the drum without the hose attached. The air hose must be connected only when the operator wants to activate the drum lift or tilt action. You can move the drum handler without the air hose connected. Hoses with quick-connect couplings can be installed at several locations in your facility where lifting or pouring is required. We recommend against moving the unit very far with the drum raised far off the floor. This is because the unit is more stable with the drum closer to the floor. If pouring is required at a given location, plan to enable lifting and have an air hose installed. Avoid unreasonably rough or non-level surfaces. Move at moderate speed. Carry drum only high enough to avoid contact with the floor or obstacles. The air supply line should include Filter, Regulator and Lubricator (FRL). If the connection points are relatively close, more than one hose might connect to a single set of FRL. If connection points are relatively far apart, each should have a set of FRL. 10. 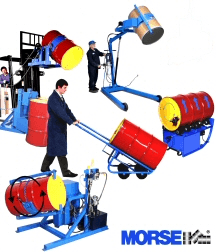 What standards does Morse below-hook drum handlers comply with? Each Morse below-hook drum handler ships with a Load Test Certificate. 11. Where can I get a Certificate of Compliance for my Morse drum handler? 1. How can I find my local Morse dealer for drum equipment? Morse dealers are located throughout North America and in many other countries. Locate your local Morse dealer for drum equipment by completing the online RFQ form. 2. Where can I purchase parts for my Morse drum equipment? You may place an order through your Morse dealer. 3. What will price and delivery be? Please contact your local Morse dealer, request a quote online, or call us at (315) 437-8475.